Having read it, I can suggest two ways of reading it. The first is to read it chapter by chapter, even if not exactly in order, and be carried along by the narrative. Michael Pallamary has an engaging style of writing. He knows his material and describes the situations and the characters vividly. Especially interesting is the way he interweaves quotes from old newspapers and reports of the surveyors with the narration and the biographical information. But if you read the book this way, you will lay it down when you are finished reading it and mostly forget what you have read. I found that the places, dates and individuals melted together too much. The second way is to read the book analytically. Let me show you what I mean. It would also have given me the relative location of the places discussed in the book. The old mission lands are now apparently part of the city, and Coronado is on the coast nearby. But I still have no idea where any of the ranchos are or where the Julian Gold Mines are. The present-day San Diego County is only about one-tenth of its original size (map on p. 348), and many of the incidents described in the book occurred in former parts of it. But they are written without distinguishing the former and the present parts of the county. If you read the book chapter by chapter, the dates also become a blur. A page-long list of the significant ones would place events in proper context. 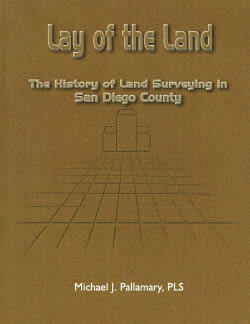 The pivotal year for this book is 1850, the year in which California became a state and San Diego a county. But the border between Mexico and the county was already surveyed the year before (the year of the gold rush), as a result of the Treaty of Guadalupe Hidalgo the year before that. Hostilities between the United States and Mexico had broken out just two years before that, in 1846. Spain had ceded California to Mexico only 24 years before that, in 1822. But the mission of San Diego had already been founded in 1769. But in the 1870s and ‘80s, an unprecedented land rush occurred. The land seemed to be there for the taking. Only it wasn’t. All the good land had been taken by the huge ranchos, and the newcomers resorted to squatting on them and on Indian lands. Title to these lands was not always clear, and some of the “settlers” succeeded in obtaining land in that fashion. Most of them left after a year or two, but only after they had succumbed to fraudulent land deals, often based on fraudulent surveys. The corruption pervaded the political and banking systems and reached all the way to the surveyor general’s office (see Joe Knetsch’s “The Surveyor and the General Land Office” in the October 2010 issue.) The boldness of these frauds is incredible. The characters at the center of all these events are, to put it mildly, fascinating. They are the Anglos who came west beginning in the 1840s. At first they are mostly military men in buttoned uniforms. Then there are the civilians, all in suit and tie, including the surveyors. They show grit and determination, whether they are up to good or no good. The work that the surveyors did staggers the mind. The conditions they endured were unbearable. But the quality of their work—even of those who faked survey notes and section plans—was unparalleled. Being of a different age and disposition, I do not recognize myself in them, but my pulse quickens when I look at their portraits. The choice of how to read this book is yours. My suggestion is that you first get a map of the county, acquaint yourself with all those mellifluous names—Buena Vista, Del Mar, Escondido, Carizzo Gorge—and refer to it as they come up in the text. Second, circle the dates and keep track of them, either on a separate sheet of paper or at the back of the book. Third, bracket the biographical data as if it were an insert and pick up the narrative where it left off. Doing all this is work, but I guarantee that it will increase your enjoyment of the book. This is Wilhelm Schmidt’s farewell article as a writer for Professional Surveyor Magazine. He’s been writing for us for 15 years, and we will miss his insights. He has not stopped writing though; he’s currently working on a non-fiction book manuscript. You can reach him at willischmidt@verizon.net. Wilhelm Schmidt is the former owner of the surveying firm Bascom and Sieger in Allentown, Pennsylvania. You may contact him at willischmidt@verizon.net.